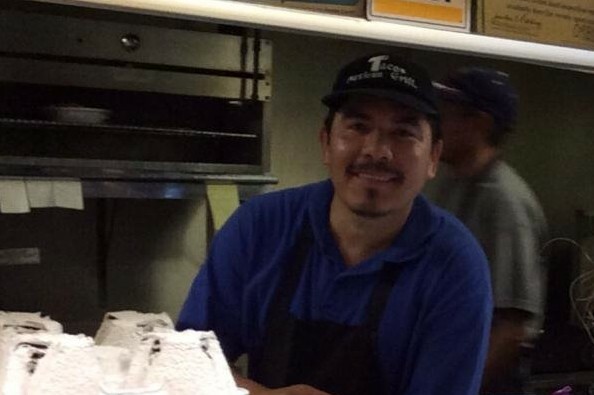 All Donations paid will go directly to Jesus who works at T2 Taco for his heroic actions. When a would-be kidnapper punched a nanny and ran off with 4-year-old boy in her care last month, witness Jesus Delgado leapt into action to stop the man. On Tuesday, Delgado, left, was honored as a hero for saving Grady O'Brien, right, and subduing the kidnapper until L.A. police could arrive. Part of the $26,000 raised by the community to thank Delgado will go toward paying medical bills for his own 4-year-old daughter, who has a heart defect. Jesus, you're a true hero! Truly a good human being, doing as would the One whose name he shares. BLESS HIM. I got to this story too late to make any donations,(lack of finances) but I WILL say I'm grateful that this world still has people like Jesus. The fact that he went out of his way and put himself in danger to help a child stay safe, that's the textbook definition of heroism in my book. Jesus, from my wife and myself, THANK YOU for rescuing that child and making the world that much safer. You deserve all the good karma and rewards coming your way. And to all those who choose to come up after me to post negative comments? Shove it. Jesus is a true Hero! The Moms of Westchester and Playa del Rey set this up because he saved one of our neighborhood children from a kidnapper. Once we found out from his fellow employees/employer (who have nothing to gain from this) about his daughter we jumped in and set this account up. I want to personally thank everyone who has donated to Jesus. He deserves every single penny plus more. This man saved a child's life and kept a family together. There not a dollar amount that would be enough, but we hope this will change his life for the better. Sometimes I feel overwhelmed when I think about all the evil in the world. But then I remember that for all the evil, there's also a lot of good out there to stand up to it. You exemplify this, Jesus, and for that I am grateful. Allen, Kevin, and the other nay-sayers. 1st) most people are giving between $5.00 and $20.00, so most people are giving small amounts in thanks for his saving a child. 2nd) Just because you don't believe that he deserves the total, doesn't mean that he does not. No one asked you to make that judgement. The only thing you get to decide is if you want to contribute, the rest is just you spouting without any real knowledge. 3rd) If you have "proof" that he does not have a child with a disability, then show it, otherwise, you are just being a skeptic, and most of us don't care if you do not believe, 4th) I'd rather give money to Jesus than to Zimmerman, he got more than $100000 for killing an unarmed teenager that he stalked. I gave $20.00 several days ago and am not in the least bit unhappy about helping Jesus. It is my money and I don't need you to approve of what I do with it. $20.00 would hardly pay for one meal at a restaurant for one person. I don't need your approbation. Gabe, Jesus has a special needs child per the reports. Sometimes people do great things and others want to show their appreciation for being such an inspiration to others. Some will donate for this cause and those who don't see at least why others do it, search your heart. You should keep your money! Way to go Jesus!! You saved a young life and everyone who personally knows her. Buy something nice for you and your family. Make me believe in the good of this world! Thank you for being there, for acting quickly and swiftly even in the face of danger, as a mom, thank you so so much! Hope you get to do something special with those fund, for yourself and your little girl future. Namaste! Gracias Jess por su acto valiente para salvar a un nio. Que Dios siga bendiciendo a usted y su familia. Que su acto altruista ser recompensado con el don de sanar su hija. Su acto desinteresado es reconocido y visto en todo el mundo. Gracias. Awesome! A hero in my book and thank you Jesus. You sir, have shown the world the true meaning of the word courage. May you and your family be blessed. Hi everyone. Im Jesus Delgados wife and I just want to take the time to thank everyone for your comments :) I am very proud of him and I am so happy, Blessed and grateful with God for my husbands and Gradys life. Thank God they are both alive and safe. Thank God it was a happy ending. So from Jesus Delgados, me and our daughter... THANK YOU all for your comments and Donations for his herotic actions. What a wonderful thing you did and you have just saved that child and his family from such misery. God bless you. Thank you for stepping up and doing the right thing. Saw a reality show yesterday from LA that made me sick (spoiled, ungrateful, profane people)and then I read your story. Happy to know that there are still wonderful people around - you made my day! Keep us updated on your daughter. My prayers for her and all your family. Gracias Jesus!!! Que Dios te bendiga a ti y tu hija.